I've been hiking the Jersey woods for years with just a friend or dog in tow. Lots of people familiar with the trails and terrain in northern New Jersey prefer it that way. But organized group hikes carry a certain appeal for those looking for new challenges or guidance getting started. Hiking has great merit as a social activity; it emphasizes special characteristics in people. The woods can even be a bonding agent, or at least a place where you might find someone you want to bond with. Specialized hike promotions have come to the fore by organizations like the Sierra Club, which offers hikes all over the region. I chose one for review ­ a hike in the Watching Reservation in Mountainside. At the parking lot, trail leader Patrick Montague of the Sierra Club Singles passes the sign-up sheet and goes over the rules. Don't get separated; no lagging; stay in back of the leader and in front of the sweep. Don't lose sight of the person in front of you. We'll walk at a moderate pace of 2MPH uphill and down, on unmarked bridle trails and a combination of blazed. We'll do 7 miles in 3.5 to 4 hours, stop for lunch and several breaks. We enter the May apple-strewn woods with 37 people and a few dogs. Well-behaved dogs are allowed on the hikes, but good trail etiquette demands having control of your dog. The path crosses the orange trail, the blue, the yellow, the white, and back across green, the sierra trail, up through the pine groves and out at a pavilion. We spend a half hour there, eating and talking. With a group this size, it's difficult to step off the trail when nature calls, so we take advantage of all facilities. A few fast hikers leave and some begin the hike here, for the range of abilities spans the limits and most are accommodated. This is a hike for singles, presumably for one person to meet and impress another. "Nothing is hidden here. What you see is what you get," says one woman. "The packs don't exactly flatter our figures. The clothes don't hide fat. There's no hairdo or make-up. The only thing worse is diving and wearing a bathing suit." Along the stream there are old foundations and a waterfall that runs through chiseled rock, perhaps part of a long-ago dam. Water cascades over the hillside too, but no one stops for long because this is a group thing. What is it that makes people want to do a group hike? Don Carlo from Bloomfield comes on the singles hikes because he's always looking, he says, and it's a little exercise. Carlo met a few women here, who he later took out to eat but not hike. The relationships didn't last. Flowers bloom along the way ­ vinca, marsh marigold, spring beauties, rue anemone. Up on top of a hill there are great views but nobody stops. Mr. Beck from Rockaway is here to meet a girlfriend. He's met a woman from a hiking group before and did go hiking with her, but the fling came to an end. We come upon the Deserted Village that once was a resort and a paper-making town called Feltville. Some houses and the church/store are renovated and people live here now. Alfonsina Savino from nearby Berkley Heights is the sweep. She walks behind everyone to make sure we're all together. She comes on these hikes because she's a member of the Sierra Club. The man she met five months ago and continues to see is the group leader, Patrick. She wasn't looking for a date when she met him, but had just wanted to socialize. Montague says he'll turn you away from his hikes if you're not prepared. Bring water, wear hiking boots on rough terrain, and out-of-shapers stay home. Adventures For Women caters to people new in the area and those who just don't want to be in the woods alone. They offer women the opportunity to learn basic woodswoman skills like how to read maps and compasses, paddle, tie knots and identify plants. 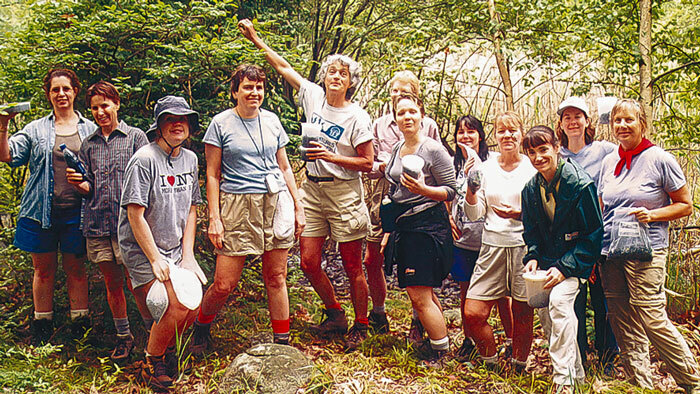 AFW is a non-profit guided hiking group for women only that started as business 22 years ago. Membership entitles you to day hikes, bike rides and, for a small fee, workshops and weekend vacations from March to December. "Joy" hikes, bike rides and paddles run from a half to a full day in the New York/New Jersey area. "You get a guide, a map and the comfort of a pre-scouted trail, someone trained in CPR and somebody who keeps you safe," says Betty Plunkett, director. "We teach women to get over their fears. Most people can go well beyond what they think they can do when put to the test." Adventures For Women on a blueberry hike. There are steadfast rules, and "No Men" is one of them. Twenty-two years ago, the founder found that women learn better without men around, and that the men aren't interested in learning anyway. They turned the hike into a competitive sport. AFW wants women to be comfortable and competent in the woods. Rules include hiking boots for safety and support, and water. They're not into backpacking at AFW, so relax. Bed & Breakfast stays are also the rule. "It's very modest and clean and everyone gets a hot shower at the end of the day. This is a good way to get into the woods." Another great way to get through the woods is on the Paulinskill Valley Trail that follows the old New York, Susquehanna & Western Railroad bed through Warren and Sussex Counties. The Paulinskill Valley Trail Committee was responsible for getting this gem along with the Sussex Branch Trail, another abandoned railroad bed in Sussex County, made into the Kittatinny Valley State Park. Now that their mission is accomplished, they've adopted a new one--they've become Friends of the park. Member Marty Grossman schedules a plethora of hikes of all ilks. How about a full trail hike ­ 27 miles of Paulinskill or 20 of the Sussex Branch? Or hike other abandoned railroad beds and canals in the Poconos and Catskills. "Walking on these rail trails is easy with a gradual grade and soft cinders. The right-of-ways are wide so you won't brush up against brush. The risk of ticks is minimized. Bring sunscreen and something to drink." They publicize 5 to 7-mile hikes and they accommodate people by planting cars along the way. There are off-trail hikes like the Ben Franklin Bridge in Philadelphia and the Manhattan bridges ­ two in one day with dinner in China Town and dessert in Little Italy. "Bring a trail lunch, if we don't eat on the bridge because it's too windy, we'll go to a park nearby. At the end of the day we go to dinner to some fancy restaurant," says Grossman. City hikes are researched with a cultural or historic aspect. Space is limited due to logistics and reservations are made months in advance. Finding out about these exotic hikes is easy if you know the score. Get the "Signal" ­ the Committee's newsletter. To get it: become a member, show up for an advertised hike, call the club, attend a meeting or order it from the website. Trail hikes are posted on the website. There are country bridges hikes too, like the Pochuck Quagmire Bridge ­ a new part of the Appalachian Trail that spans a marsh like a super highway. 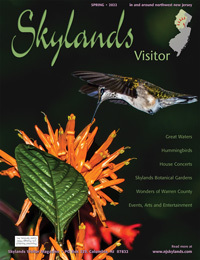 "The Committee feels the Skylands area should be preserved as much as possible as an eco-tourism area." More northwest jaunts are an explorer's delight. "I do these crazy hikes every week," says Mike Helbing, who shares the wonders of Warren County with the rest of the world on his 20-mile hikes. "In my opinion, it's the best place to be. The area is so rich with history and natural features." Every Sunday, Helbing and a large group hit the trails, fields and roads of Warren County to discover its secrets. He finds special places to explore, like Rt. 46 where the glaciers ended and left interesting land formations, the railroad beds, the canals, and the abandoned quarry he recently found near the Tetertown Ravine. And how about the Columbia Trail? Merrill Creek Reservoir anyone? The group is not an "organized" group, but they walk come rain, shine or snow and Helbing'll bring just about anyone. How organized is that? "We gather for fun. We have a blast. Anybody I meet it's like 'hey, you like hiking?'" He even hikes all winter long -- 15 miles once through deep snow. Helbing says the hiking trails need to be brought to the forefront, like the abandoned Delaware Lackawanna & Western line, the first railroad to cross the Delaware River, built in 1856. He walks it twice a year and sees the two long tunnels with minor cave-ins, water, and the need for repair. "They talk of blasting them shut. I don't want that to happen to the remaining structures. Look at the Morris Canal. They filled that in and they're now scrambling to save it. Why start later to save it when you can save it now?" Some upcoming hikes are the Paulinskill Valley Trail, the Morris Canal from Waterloo to Washington, and the lower part of Stokes Forest including the Appalachian Trail from Culvers Gap to Sunrise Mountain with numerous side trails. If someone only wants to go five miles, that's ok with Mike. He'll help find a place to leave your car. Bring lots of water, some food, comfortable footwear and moleskin. "Be prepared for all that stuff. Sometimes we cross a river." The Appalachian Mountain Club is big and imposing. Perusing their website gives one a sense of importance and holiness. They've got prayer books of rules in order to hike with gods. Founded in 1876, the AMC is America's oldest conservation and recreation organization, and with 94,000 members nationally and twelve chapters, it's one of the biggest. Their tenets are conservation, education and recreation. Through appreciation of an outdoors experience, the AMC hopes that people will feel the need for conservation. The New York-North Jersey chapter alone has over 17,000-plus members who receive the newsletter, Trails and Waves. The AMC is a must for people who search the region for the endless trail. The club runs more than 50 hikes a month, now impossible to list on their website. Instead, there is other information. The Illustrative Hikes page alphabetically describes a couple hundred places they hike, each with a four-part code that tells pace, terrain, mileage and who's running the hike. The Join Us On Our Hikes page describes how anyone can participate ­ either join the club or get a $15 guest card, good for four months. The New York/New Jersey Trail Conference doesn't run hikes themselves, but for a small fee you can join their club and receive "Trail Walker," their bi-monthly newspaper. It's loaded with hikes run by their 85 hiking group members. Larry Wheelock, trails director, says their mission is to develop and maintain trails ­ all 1,500 miles of them. The NY/NJTC has detailed maps and books for sale on the web, by mail or at the office to help hikers get the most from the trail. Their website offers hiker discussion groups and links to clubs, parks, hikes, maps, campgrounds ... all the information a hiker could want. 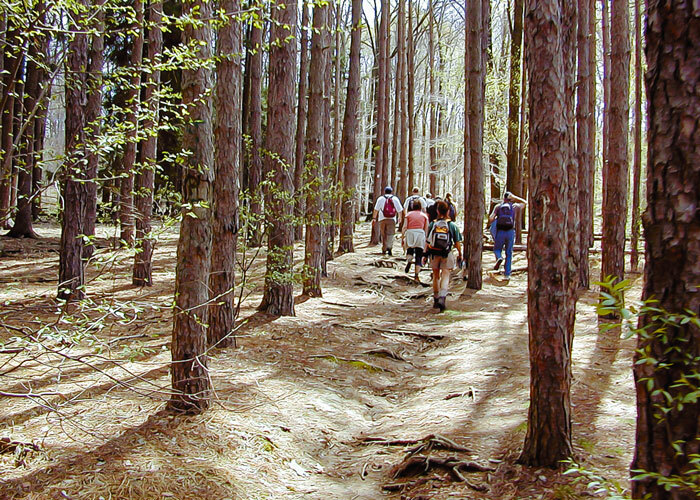 Frost Valley Trail Walkers is one NY/NJTC member who holds hikes four days a week. Every Monday brings a short, easy walk on level ground for novices. Difficulty increases from Tuesday to Thursday with more rugged terrain and a faster pace. From 15 to 40 of the group's 300 members gather to hike in Jersey, NY and PA. They're looking for a little challenge year-round. The hikes are open to the public. "Come try us out a few times," says Jean McLellan, president. Another member hiking group is the University Outing Club. Mostly retirees, the club schedules their two to three-mile hikes in combination with an aspect like birding or botany from September through June in NJ, NY and PA.
And largely, the NJ Audubon Society, through Weis Ecology Center in Ringwood, offers a range of group hikes from easy for families with kids to moderate and strenuous. Most hikes are in the Highlands, with others in nearby parts of Jersey and the Catskills. Hikes include wildflower walks, caving, some overnight. 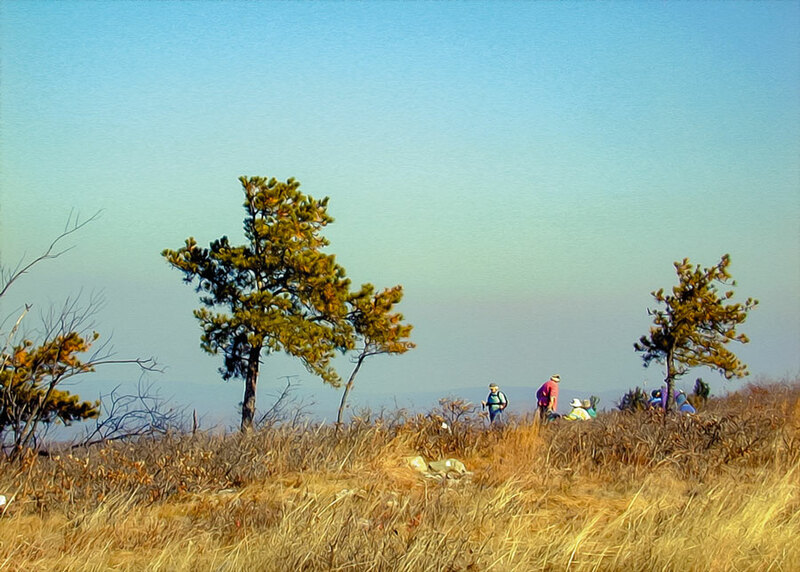 The Weis Wyanokie Wanderers hiking club is for serious hikers in good cardiovascular shape. "The terrain is steep and the pace is fast," to quote the website. The NJ Audubon Society, headquartered in Bernardsville, is one of the oldest independent Audubon Societies in the country, with no relation to the national organization. Their mission, through eight nature centers including the 160-acre Weis, is to promote environmental awareness, to protect NJ's wild species and to preserve habitats. The region is swamped with hikes for everyone who ever considered hiking. More groups can be found on the web and in publications of the above organizations. No reason exists for anyone to stay indoors for want of someone to hike with. All of these groups welcome the walker. Sierra Club Singles, 973-364-7573. Non-members welcome. Adventures for Women, 973-644-3592. Non-members are welcome for a fee. Paulinskill Valley Trail Committee, 908-684-4820. Non-members welcome. Helbing's Hikes. 908-835-9137 or email. All welcome. No fee. Frost Valley Trail Walkers, 908-464-6246. Non-members welcome. University Outing Club, 732-634-7244. Non-members welcome.